It’s time to delve into the sometimes confusing world of Italian wines. Like France, Italy generally names its wines by the region in which it is grown. 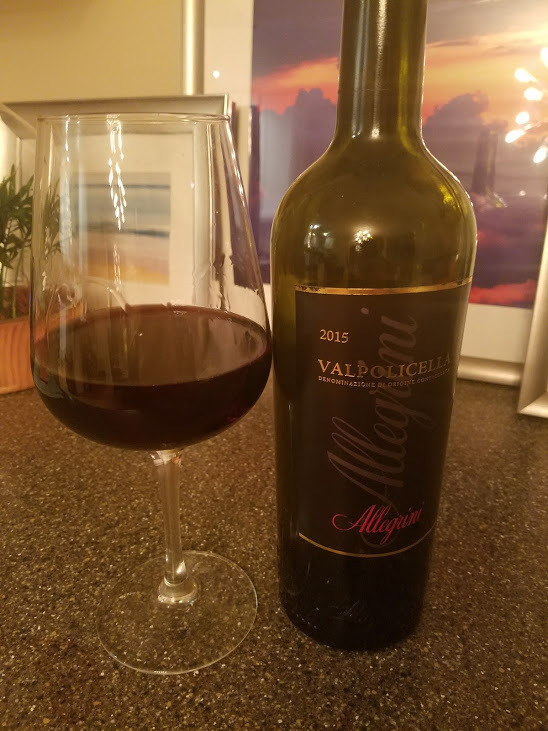 Valpolicella is a region in Northeast Italy, near the border with Austria, which translated means “Valley of many cellars.” The Valpolicella blend is based on three red-wine grape varieties grown in the region, Corvina, Rondinella, and Molinara. This blend is used to produce a variety of delicious wines, from rich (and expensive!) Amarone, to light and sparkly Prosecco, to a dry table wine, which is what I am reviewing today. Allegrini is one of my favorite Italian wineries. I have literally never had a bad Allegrini wine! 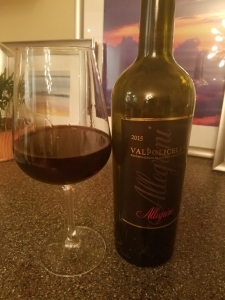 Their 2015 Valpolicella is another of my go-to bottles, light and crisp enough to sip slightly chilled out on the deck, but with enough juicy flavor to handle lasagna at dinner. Pull the cork and you’ll notice soft black cherry aromas with a hint of cocoa. What I love is its juiciness – it’s smooth, yet mouth-watering, with nicely balanced tart cherry and raspberry flavors. At around $15, this is an excellent wine for the price. If you can find it, stock up! On my five-cork scale based on taste and value, I give the Allegrini Valpolicella 4 corks! This is an excellent wine, which Decanter magazine describes as “wonderful,” and gave it 93 points. With that kind of acclaim, buy it now before the price goes up! If you’d like to try interesting wines like this, please join me at our next private wine party at Seasons 52! I host a wine dinner every month, featuring four delicious wines, paired with a four course dinner prepared by a master chef. There are always cool prizes to win, too, so listen Wednesday at 4:15 to win your spot on the guest list, or click here for a chance to win!